We believe everyone deserves lasting access to safe water and sanitation. We have a proven solution to the global water and sanitation crisis. With programs in nine countries, we bring together local entrepreneurs, community members, and local governments to build and deliver water and sanitation services that last. We want every family, clinic, and school to have lasting access to safe water and sanitation for generations to come. We call this impact model Everyone Forever. Water For People works to reach Everyone in a district. This means reliable water and sanitation services for every family, clinic, and school. We want every single person – even the hardest-to-reach, the most vulnerable, and the marginalized – to have access to safe water and sanitation services. Reaching Everyone is just the beginning. We work to make sure water and sanitation services are sustainable. Forever means building from the ground up and top down – empowering communities, service providers, and governments to invest in the long-term water and sanitation solutions that are right for them. Sustainable water services means water supplies are protected, managing institutions are functional and funded, and communities are aid-independent. Water For People never fully funds water and sanitation infrastructure, because we want to make sure the districts we work with are invested in their own water and sanitation services. Individuals, communities, and governments become our partners, bringing their support, labor, skills, and money to every project. Districts own the systems they build and are responsible for their care. Sustainability is at the core of everything we do. We're creating systems that will last, and to do that we focus on building capacity so communities can finance and maintain the systems when we're gone. Water For People trains local service authorities to collect data, monitor operations, and keep systems at high levels of service. This monitoring keeps service authorities accountable to the people the water system is serving. We believe that once momentum builds at the district level, replication across countries, led by national water authorities, becomes easier. We advise and influence communities and governments to build out regional and national Everyone Forever initiatives. To achieve Everyone Forever, four forces must work together to create systems change – community, government, market, and technical. 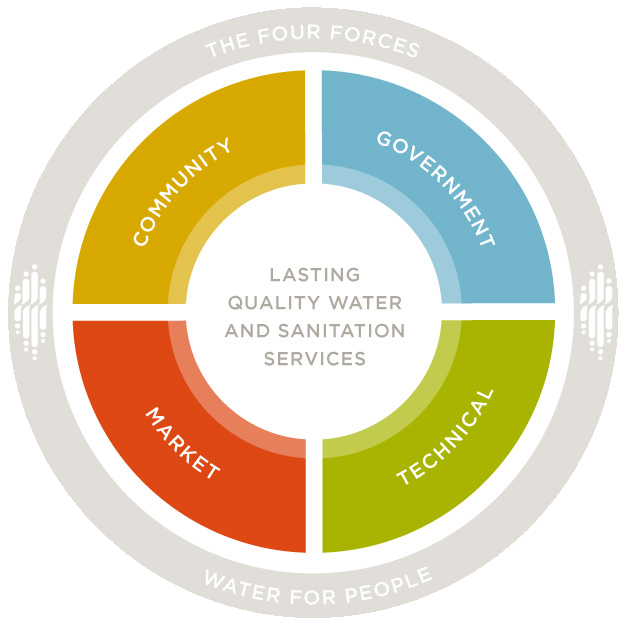 Water For People helps build capacity within each of these forces to promote water and sanitation services that last. 2.1 billion people around the world don’t have access to safe water. Safe water reduces water-borne diseases like diarrhea and cholera and saves hours every day spent fetching water – especially for women and girls. Safe and reliable water keeps families healthy and lets children stay in school. Establishing safe and reliable water services is about more than digging wells and installing pumps. It means mapping out water systems to reach every community and household and collecting data to make sure water keeps flowing. It means training mechanics and establishing a culture where people pay for water service, so water points can be repaired when they break. This systems-change approach makes water services sustainable and reliable. 4.5 billion people around the world lack access to adequate sanitation. Safe sanitation services give families dignity and promote community health by eliminating contamination of water supplies. For us, promoting safe sanitation services means developing sanitation markets. We want to make sure families have affordable options for materials to build bathrooms, contractors to build and maintain their bathrooms, and safe waste management services. For this to happen, we invent new sanitation technologies and empower sanitation entrepreneurs like masons and pit latrine emptiers throughout the sanitation value chain. We partner with microfinance institutions to provide families with loans to build bathrooms and work with communities to reduce open defecation rates, creating behavior change around sanitation practices. While water and sanitation infrastructure are important, people must also understand the importance of using it. Behavior change and education about safe hygiene practices are included in all our interventions. On the community level, our hygiene work includes social art performances that motivate hygiene behavior change. In schools, we create hygiene curriculum and support teachers who lead Sanitation Clubs or set up Hygiene Corners in their classrooms. We make sure schools have hand-washing stations and toilets and support menstrual hygiene management, so girls have the education and resources they need to stay in school when they get their periods. Driven by our core value of Transparency, we created Everyone Forever Tracker to visualize the impact Water For People is having globally. In 2017, Water For People released our five-year Strategic Plan, which focuses our efforts on bringing our Everyone Forever model of sustainable, quality services to 4 million people in over 40 districts by 2021. Ultimately, through our collaborative efforts to advise and influence other actors and national governments, this work will multiply our impact 20 times, from 4 million to more than 80 million people at the national level.